Happy Birthday Anna - the great 8! My little spunky monkey has turned 8 today! She is loving, a smarty pants and a giggle bunny all rolled into one. Loving: She loves to give Brian and I hugs, everyday when we leave for work or school we get wonderful hugs to start our day. Smarty pants: She likes to get her way and when she doesn't she shuts down pretty fast. She usually curls into a ball and pouts on the couch. She is very stubborn, friends or family can't convince her to do anything she does not want to. This might be a good or bad thing in the future. Giggle bunny: Anna loves to laugh, from tickles, movies or fun silliness with her big sister. 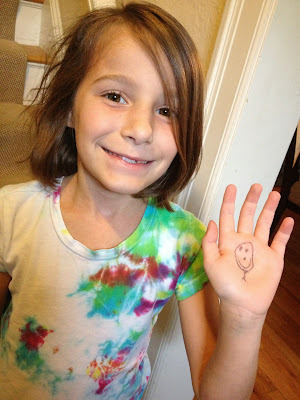 The other day she came out of school with this drawing on her hand, she told me she drew it on her hand to remind her to be happy. Oh, I just love that! Here is a list of her favorite things right now 11/1/13.